Many birders come to Michigan with the intention of adding Kirtland's Warbler to their life lists - but the state should by no means be dismissed as a 'one species wonder.' Surrounded by four Great Lakes, Michigan boasts 3,000 miles of shoreline. Add the additional habitat afforded by 11,000 interior lakes, 36,000 miles of rivers and streams, and the largest state forest system in the nation, and it's not surprising that Michigan's official bird list now stands at 421 species. 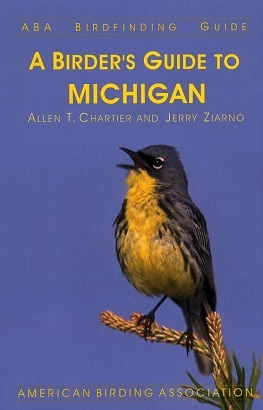 A Birder's Guide to Michigan describes over 200 sites, with details on each site's birds, best seasons, and driving directions, accompanied by 200-plus maps. Thoroughly researched bar graphs describe the seasonal status and abundance of the state's regularly occurring species, and an annotated list of specialties will guide birders to some of North America's most sought-after species. A bonus is an appendix listing the state's amphibians and reptiles, butterflies and dragonflies, mammals, and orchids - Michigan is home to a stunning and sometimes rare assortment of these gorgeous plants. 660 pages.